Norman Marchena is the new coordinator in the fight against human trafficking. He works for the Ministry of Justice and has a vast experience in the Justice sector. He was also an advisor to the Minister of Justice. “Is there human trafficking and exploitation in Curacao? Yes, there is! But there are no scientific investigations done to determine in which form or magnitude this is taking place. Not all victims come forward to file a complaint for us to get the data,” Marchena said. One of the major cases involving human exploitation is the case of the Cubans against the Curacao Dry Dock (DOK). These Cuban workers sued DOK and actually won the case. The court ruling was in the United States. “We are also dealing with the Race Café case, which will be treated in court on May 14 of this year. We will give more information about this case at a later stage,” Mr. Marchena indicated. According to Mr. Marchena, there are certain areas in which there could be cases of human trafficking and exploitation. These could be, but not limited to, the construction sector, domestic service, hospitality industry, agriculture, animal farms and prostitution. “We are doing a crime analysis, which takes place on a regular base so we can analyze patterns and trends in this type of crime. This way we can deploy our resources in a more effective manner and assist authorities in identifying and apprehending suspects,” Mr. Marchena said. Every two years a Dutch expert in this field comes to assist the Public Prosecution in this analysis. “The analysis indicates what type of actions should we take and where should we investigate. The investigation should indicate people’s movements at certain times of the day, where do they go and where are the large agglomeration of people, which probably has something to do with illegal activities. In many cases, these illegal activities have something to do with human trafficking and exploitation. Thus, this report gives the government an indication in which areas they should pay more attention,” Mr. Marchena said. On October 18, 2013, the Minister of Justice, Nelson Navarro instituted a so called Taskforce Human Trafficking and Exploitation. This task force consists of representatives of the Public Prosecution, the Ministry of Social Development and Labor, the Directorate of Foreign Relations, Customs, the Police Corps, the Ministry of Justice, the Department of Labor and Work safety inspection and Victim Assistance. 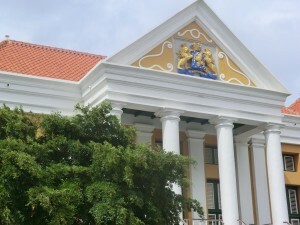 The areas of responsibility of the Taskforce are to design a policy and act against the human trafficking and exploitation in Curacao. The Taskforce will work on Prevention, Victim assistance and Investigation and Prosecution of criminals. The Taskforce will also give information to the civil servants and the public in general. The group will focus on setting up a central information and contact point where people can call and give tips or information to the authorities. Mr. Marchena explained that the countries in the Dutch Kingdom are working closely together. This was already the case before October 10, 2010 when the Netherlands Antilles still existed. In February, Mr. Marchena met with the Dutch coordinator Mrs. E Pennings and also his Aruban counterpart Mrs. J. Richardson. In May there will be a video conference between the coordinators of Curacao, Aruba, Saint Maarten and the Netherlands to inform one another about the process in each country and also possible strategies against human trafficking. At least once a week the new coordinator will give information to the public about his work in the fight against human trafficking and exploitation. If there are questions please send these to info@curacaochronicle.com.